Speaker: Scott Meyers, Principal, Self Storage Profits Inc. 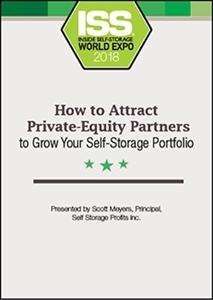 Learn how to “10-X” your self-storage acquisitions and development projects by tapping into the billions of dollars in private capital seeking investment into the asset class. Our presenter will show you how to put together a group of private money investors and the proper way to create and present an attractive investment offering to the private community.